Once top management makes organizational stability a priority and designates an empowered leader to direct the project, creating universal commitment is next. This encourages all stakeholders to elevate sustainability to a level on par with all other objectives like profit, quality and operational excellence. Integrating the mindset of sustainability into every individual aims at creating automatic behaviors. Refining processes and purchasing to enhance sustainability is a key to achieving sustainability. From a business perspective, sustainable projects bring a new dimension to business performance. Eco-friendly efforts can increase sales by enhancing the brand or reduce expenses by eliminating operating costs. Collective participation and employee buy-in awakens a sense of pride and boosts cooperation among team members. Becoming a sustainable organization starts with setting specific and measurable goals. Reducing energy and water consumption, eliminating harmful emissions and recycling waste are common sustainability goals with readily quantifiable results for tracking progress. Setting a goal of lowering energy costs by 10% may seem like an aggressive goal, but in a large office, simple behaviors like turning off lights and other electrical equipment when not in use can this save thousands of dollars per year. Cutting water consumption by a target percentage with more water-efficient bathroom fixtures and changing landscaping to drought-resistant grass and plants can be a start to achieving water reduction goals. Brainstorming is an effective way to engage every team member, elevate everyone’s sense of participation and to create a specific set of project ideas. Upon considering how their departments can be optimized for sustainability, team members will often identify specific ideas to improve processes and efficiency. 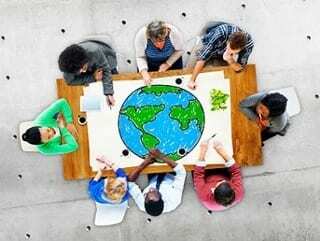 An article in the August 2013 issue of “Environmental Leader” discusses the benefits of empowering employees to identify and implement sustainable programs. Sharing the responsibility to implement and execute sustainable projects can be a morale boost and achieve a level of commitment that may not have been present otherwise. One example of employee participation was when employees at a Carterville, Georgia brewery conducted frequent “water walks” to identify water wastage. Changes from these observations resulted in a reduction in water use of 49 million liters (12.9 million gallons) per year. Achieving sustainability goals, morale-boosting pride, and improved teamwork were other benefits of the brewery’s water walks. Whether a company is manufacturing, using, or selling products that could be more sustainable, collaboration with suppliers regarding sustainability goals often yields positive results. Sources of raw materials and supplies may require drastic change. In many cases, vendors choose to collaborate by changing their process to support the effort. This collaboration produces a duab-benefit: for purchasers, a more sustainable supply chain contributes to overall sustainability goals and branding efforts; for suppliers, working with purchasers enhances customer loyalty and positions them as a solutions partner rather than a supplier in their purchasers’ eyes. In other situations, supply chain managers opt to change suppliers who may not be supportive of the initiative to achieve sustainable objectives. Supply chain-based strategies may include changing or reducing packaging, reformulating cleaning materials, and introducing eco-friendly components like soy-based paints to replace high-VOC petroleum-based coatings. How does your organization develop group commitment when it comes to sustainable initiatives? Share your thoughts in the comments!